DiHydro has kept Henry Ford Hospital free of Legionella Pneumonphila and protected their piping systems for over 23 year. Supplemental chlorination combined with a Corrosion Control Program has kept Henry Ford Hospital free of Legionella Pneuophila and protect the piping systems for 23 years continuously with zero cases of infection and no increase in corrosion, pitting, or pinholing of the galvanized or copper piping. In 1987, Henry Ford Hospital in Detroit, a 937 bed tertiary care facility experienced seven confirmed cases of Legionella disease within five months. The source was traced to the potable hot water system. Testing revealed 16.2% of patient case hot water sites surveyed cultured postivie for L. Pneumophila. DiHydro, working with the hospital's facility maintenance staff, conducted heat flushing of the hot water piping and outlets. One hundred fifteen (115) test sites were used as a base reference. The results: 66% reduction in positive cultures. After 4 months different serotypes reoccurred in the areas heat flushed, along with new positive sites. This suggests that the distribution piping system was being reseeded by L. Pneumophila from areas not contacted by the heat flushing. DiHydro initiated continuous supplemental chorination at 4 ppm combined with the initiation of a simultaneous corrosion control program to off set the potential corrosion caused chlorine. After 10 weeks of supplemental chlorination, all 115 sites cultured negative. After 23 year, (2010 and continuing) corrosion within the treated piping system remains under control. Supplemental chlorination is maintained and monitored continuously. As a result, no cases of Nosocimial L. Pneumophila have occurred in the treated areas. A problem had developed with two 42" diameter Lake Michigan domestic water intake lines for the City of Chicago; the intake pumps needed repairs. The shut off valves between Lake Michigan and the pumps would not close. The supply water from the lake was higher than the pumps, which kept the pumps flooded. The pumps had to be isolated and drained. The 42" diameter lake water supply pipe lines had to be frozen to block water from entering the pumps. The ground around the 42" pipes was wet and too soft to move the digging and construction equipment out to the pipe. 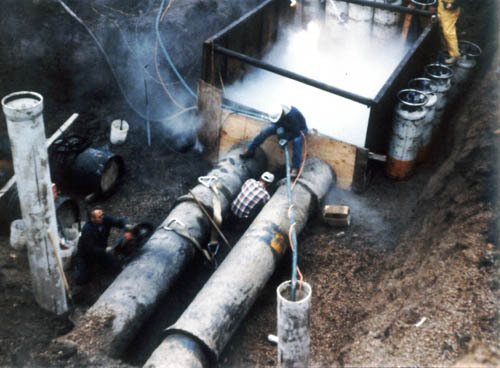 To harden the soil and make a workable road out to the 42" pipes, DiHydro drilled holes into the ground, inserted 1.5" diameter steel pipe, covered the holes and pumped liquid nitrogen into the holes, which froze the wet soil. Once the ground was hard, the digging and construction equipment was moved out to the pipe site. The two 42" supply pipes were uncovered and the ground was frozen around and under the two pipe lines. A wooden box (6' high, 12' wide and 14' long) was built around the two pipe to hold the liquid nitrogen (LN). Tanker trucks filled with LN were alternated to keep the wooden form filled until the two 42" supply pipe lines were frozen, creating an ice plug in each pipe. It took 37 hours and 20,200 liters of LN to freeze both pipes. 730 liters per hour were used to maintain the two ice plugs. The freeze was maintained for six days and nights until the repairs to the pump and shut off valves were complete. DiHydro received a phone call on a Thursday from a manager of a large downtown building. The excited manager said that the water in the 12th floor cafeteria of his building was chalk white and extremley bitter. The same bitter, chalky water was also coming from the drinking fountains on the 10th and 11th floors. He quickly stated that only these three floors seemed to be affected. He needed to know what was causing the problem, where it was coming from and he needed the answers YESTERDAY! ("I don't want to be in the papers," he said). He had already closed down the kitchen and shuf off all of the drinking fountains, lavs and janitors' sinks on the three affected floors. Within four hours of the manager's call, DiHydro's personnel had determined that the water contamination was being caused by a surfactant (a liquid soap used to clean dishes, pots and pans). Once DiHydro was able to determine the cause of the problem. DiHydro's engineers began an on-site inspection of the building's piping system: reviewing prints, piecing together clues, using the information provided by the sample results and by the building maintenance staff. Within nine hours of the phone call, DiHydro's problem-solving engineers had located a cross-connection of an automatic soap dispenser for a pot washing machine in the building's cafeteria. What happened is that several days before the problem occurred, the building's water system had been shut down for some repairs. The water systems on the 10th, 11th and 12th floors had been drained. However, the suspect automatic soap dispenser kept running. Without a check valve in the proper pace, soap had been drawn into the water piping by the slight vacuum that occurred when the system had been shut down and drained. When the water was turned on again, it mixed with the soap causing the bitter taste and chalky-whie appearance at the water fountains and in the coffee in the cafeteria. Once DiHydro located the source of the problem, the building's maintenance staff was able to repair the soap dispenser, correct the cross-connection and flush the soap from the water system. DiHydro Analytical Services then reanalyzed the water throughout the buidling to verify that the problem had been corrected and returned the system to service. By the following Monday morning, DiHydro was able to report to the building manager that the system was in perfect working order. DiHydro solved the problem quickly... By sampling and analysis with observation, reasoning and deduction. The contamination source had been located and the piping cleaned up without damage or discomfort to the employees of the building's systems. The building's management was dazzled. Problem: cost of maintaining and replacing endoscopies, instrument washer system, in-line water supply filter cartridge that clean the water and protect the instruments. The manufacturer of the instrument washer stressed a 25 micron filter be used in front of a 5 micron filter to protect a .1 micron filter. A human hair is approximately 75 microns in diameter. A 0.1 micron is 10 times smaller than a 1.0 micron, it is impossible for viruses, protoza or cysts to pass through a 0.1 micron filter. Important Issue: A single 0.1 micron filter costs $500, which does not include the labor to change it. The hospital staff was changing the filter 5 times a month, which cost $2,500 per month. DiHydro tested and analyzed the manufacturers recommendation and determined that the 25 and 5 micron pre-filters would not reduce the number of 0.1 micron filter changes. DiHydro's research reduced the 0.1 micron replacement to once a year saving the hospital $25,000 per year just on maintenance for one instrument washer. Think how much money could be saved if each water using piece of equipment was audited for operating, maintenance and repair costs with the intended purpose of improving performance while reducing costs! A 670 bed, Midwest Canadian Hospital had a nuclear medicine reactor, which was cooled by circulating chilled water through coils. The core of the reactor and its cooling coils are isolated and surrounded six feet thick with lead and concrete shielding. In October the water supply makeup alarm went off. The reactors chilled water cooling system had developed pinhole leaks in the chilled water coils. Week after week the leaks increased requiring more water to be added to the chilled water system making it difficult to keep the reactor core cooled at or below the required temperature. The quoted price for shutting down the reactor, removing and replacing the concrete and lead insulation needed to replace the leaking coil was $669,000. During this time, the facilities manager attended a seminar conducted by DiHydro Services, Inc, a company that seals pinholes and thread leaks in operating piping systems without shutting them down. The facilities manager called the president of DiHydro and asked if a chemical sealer could be formulated to seal the pinhole leaks in the reactor cooling coils. The president of DiHydro said yes; however, without an inspection of the reactor cooling coils and an understanding of the cause and size of the pinholes, the sealer could seal the holes or not and could possibly plug up the coil and that DiHydro could not be responsible for the results. The facility manager paused for a moment then said, "please make us a sealer. If it does not work or plugs up the cooling coil, I am no worse off. My one solution right now is to shut the reactor down and replace the coils at a cost of $669,000 plus the money lost because of having to shut it down for 30 to 40 days." DiHydro created the specifically formulated sealer (designed for the reactor cooling coil specification), delivered it to the hospital facility manager and assisted him injecting it into the operating reactor cooling coil loop. Three days later, the facility manager called the president of DiHydro on his cell phone at 8:30 pm shouting "it's a miracle, it worked, the sealer worked and the leaks have stopped. The reactor is operating in the proper temperature range. What do I owe you?" DiHydro's president said "how about $400 and lunch?" After five years of continuous operation, the reactor is still functioning properly. The Northeast blackout of 2003 was caused by a sudden massive electric grid power shut down that affected the Northeastern and Midwestern United States plus Ontario Canada on Thursday, August 14, 2003 at 4:11 pm. "It was as if we had been struck by an earthquake; we lost power in a blink", said Chris Reeves, Director of Facilities for Trinity Health  St. Mary Mercy Livonia Hospital. The blackout affected 45 million people in eight states and 10 million people in Ontario. The blackout originated in Ohio. It quickly swept through the State of New York, parts of New England, Ohio, Michigan and Ontario. The majority of hospitals lost water supply pressure because generators that powered their water pressure pumps did not work or burnt out from overload. The loss of pressure created a major potential for the biological contamination of the hospital's water supply. In Cleveland, all four of the city's water pumping stations that move water uphill from Lake Erie to 1.5 million customers went down at once, leaving residents without water. Since only one station is needed to pump water to all customers, officials never anticipated that all four pumps would go down simultaneously. While Detroit's water system had backup generators in place at some water utility plants, the power generated was not enough to keep a suitable amount of pressure in the pipes, leaving 4.3 million residents of Macomb County without water service during the entirety of the blackout. Despite the inconveniences and challenges of water service interruptions, however, was the fear of a more lasting effect. Namely, disease introduction through lost water service. When power generation and distribution ceases in a blackout event, the backup electricity powering the pumps that push water through a city's water system can go out as well. With a resulting drop in pipe pressure, the piping systems are open to potential public health crisis in the form of bacteria entering the water supply. In this circumstance, drinking water can become contaminated and a normally trusted water system becomes the breeding ground for waterborne infection and disease. Federal bioterrorism reponse legislation passed in 2002 requires water utilities and emergency response providers (hospitals) to assess their vulnerabilities to terrorist attacks and develop emergency reponse plans and other type of emergencies including power blackouts. But there is little to no money to develop and implement the needed and necessary plan to protect the water utilities and emergency response water supplies. DiHydro supplied continuous emergency chlorine disinfection for twenty-five (25) hospitals' primary supply water piping in four counties throughout the power blackout and through the boil water alert period (a total of 10 days), with its dual powered, stand alone emergency chlorination system, that is ready to go 24 hours a day, seven days a week. While the majority of the area hospitals were passing bottled water to patients and staff, DiHydro's emergency chlorination system was disinfecting hospital supply water and emergency standby stored water...keeping it free of harmful bacteria. Underground domestic hot water leaks in the dsitribution piping loop was costing the 312 unit, 20 acre apartment complex $200,000 per year in wasted water and gas to heat the leaking water. The underground leaks also caused a shortage of hot water available to tenants, which resulted in new leasing and tenant retention problems. At the point DiHydro Services was contacted, the property had experienced 7 leaks in a 6 month period...3 were repaired and 3 could not be located. DiHydro was brought in to assist in locating the 3 leaks, treat the distribution pipe to control future leaks, balance the hot water distribution system and address the tenant complaints related to the supply of hot water. 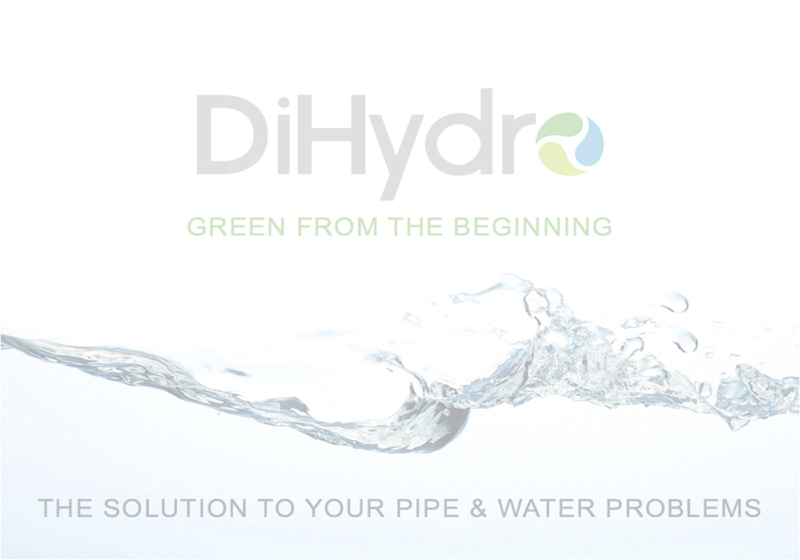 It took 4 months, but DiHydro assisted Equity Residential Properties Trust in locating and sealing the leaks, balancing the hot water distribution system, locating and removing cross connections, stablizing hot water temperatures to the tenants, and returning the water and gas use to normal without major repiping. After a weeklong holiday shutdown, purchasing noticed that the same volume of welding gas was used during the shutdown as was normally used during a regular two-shift per day workweek. DiHydro was contracted to find leaks in the underground gas supply piping. No leaks were found in the underground pipe. However, inside the plant, DiHydro located and tagged over 1,700 small, east-to-repair branch line leaks (mostly fitting connections) which cost the facility $2,000,000+ per year in lost gas.